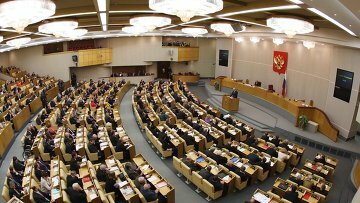 MPs propose being fined and stripped of their mandate for misconduct | Russian Legal Information Agency (RAPSI). MOSCOW, December 6 - RAPSI. According to the deputies' code of ethics which may be adopted during the State Duma's spring session, lawmakers could be stripped of their mandate for misconduct, Ethics Commission Deputy Chairman Andrey Andreyev told journalists. He said that the code would regulate the rules of MPs' public behavior, their working dress-code, and the procedure for cooperating with voters, colleagues and media representatives. Sanctions for violating this code of ethics have been proposed as well. The code reads that a deputy cannot impose his position by threats and ultimatums, cannot miss committee and State Duma meetings, cannot hamper meetings, leave the hall without a reasonable excuse, or shout out and interrupt speakers. The bill describes relations of deputies with voters, stating that a deputy bears responsibility before voters for pre-election promises. MPs' liability for violating the rules of deputy ethics is also stipulated. The State Duma may express censure on an MP or deprive him or her of the right to speak for some time, as happens now. In addition, a deputy may be deprived of half of his or her wage, may be fined or be stripped preliminarily of his or her authorities. 10:32 06/12/2012 According to the deputies' code of ethics which may be adopted during the State Duma's spring session, lawmakers could be stripped of their mandate for misconduct.